Tamaki is also childhood friends with both Konomi and Takaaki: the two see her as an older sister. She left them when they were both children, having to go to an all-girls boarding school. Her promise to come back to Takaaki and Konomi in the final year of high school is what prompted her to leave her boarding school. In the game, she is one year ahead of Takaaki. She is very confident and comes from a rich family. She is well-versed in traditional Japanese arts and traditions, yet still is a modern girl in her own right. 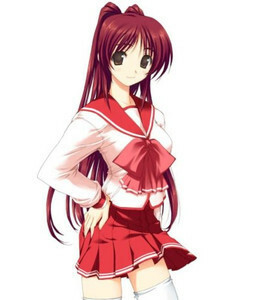 In her group consisting of Konomi, Takaaki and Yuuji, she is the strong and dominant personality and acts as the older sister figure. She often addresses herself as "Tama-onee-chan". In the game's Tamaki scenario, she is followed by a group of three girls from her boarding school. <hidden by spoiler settings>The three attempt to separate her from Takaaki as they are "in love" with her. In the process of evading the girls, she declares Takaaki to be her boyfriend and proves it with a kiss: at which point the three girls realize they have failed and return to their school.